Today instead of the usual office birthday cake, Kristina was kind enough to bake the lactose intolerant birthday girl some amazing vegan birthday cupcakes. We were all in awe of how delicious and how un-vegan the cupcakes were. 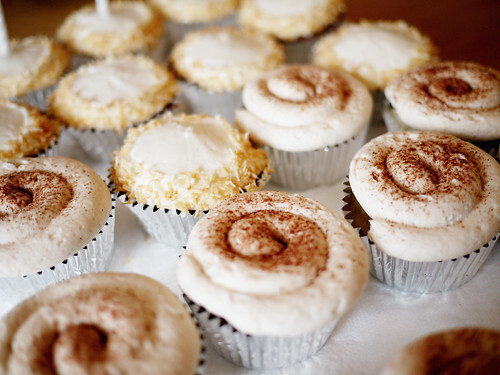 In front you see the Churro Cupcakes: (donut cupcake, filled with chocolate pudding, topped with vanilla cinnamon frosting) and behind the Toasted Coconut Cupcakes: (chocolate coconut cupcake with coconut frosting and toasted coconut). Both mighty tasty, though if we had to choose, we both agreed on preferring the coconut ones. But this is purely a matter of personal preference. Happy Birthday Karen!!! Really nice cupcakes! My birthday is coming soon and cupcakes is must for this occassion.